The Scotland Bill intends to give the Scottish Parliament legislative competence over provision of financial assistance for the type of payments currently provided by the Regulated Social Fund. This will include provision to make provision for the Cold Weather Payment (CWP) and Winter Fuel Payment (WFP), including conditions of entitlement or to replace these benefits entirely. 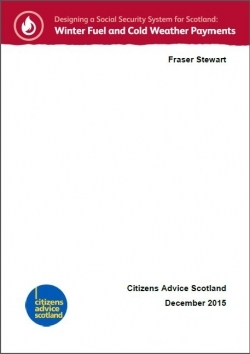 This report sets out CAB evidence and recommendations for how the new powers should be used. Scotland has some of the highest rates of fuel poverty in GB, along with some of the highest costs of energy, coupled with relatively lower incomes. The CWP and the WFP, together with the Warm Home Discount, are a package of measures that specifically help to maximise the incomes of households most at risk of or falling into fuel poverty; economically inactive pensioners and other vulnerable households, including those on low or restricted incomes. CAS has some concerns about whether the winter fuel and heating expenses parts of the Regulated Social Fund have been reaching the right groups of people and doing what they are intended to do. CAB evidence also indicates a number of other current failings around eligibility for assistance and the inflexibility of current provision in relation to the claiming process and individuals trying to receive payments, which often cause distress and detriment to low income and vulnerable clients. We believe that devolution will equip the Scottish Government with the necessary powers to respond to these issues.